The Little Sisters of the Poor have been in the Bronx for a long time! Their work started under the patronage of Our Lady of Good Counsel. It was on October 15, 1903 that a third foundation was begun in New York. 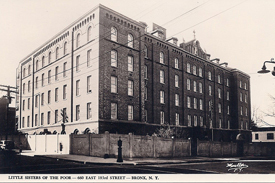 Located at 660 East 183rd Street, it served 4,780 elderly men and women in the Bronx until 1979. Construction for a new home was begun on September 8, 1977 and completed in December of 1979. It was again under the patronage of Our Lady that the move from the old Home to the new one took place on December 8, feast of the Immaculate Conception. Besides changing location, there was a name change as well. The Home at 3200 Baychester Avenue would be called Jeanne Jugan Residence. 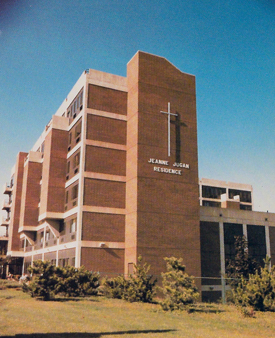 In 2006, the new Jeanne Jugan Residence, located at 2999 Schurz Avenue, in the Throggs Neck section of the Bronx, became a new home for 30 Residents in the nursing unit and 17 Residents in independent living apartments.